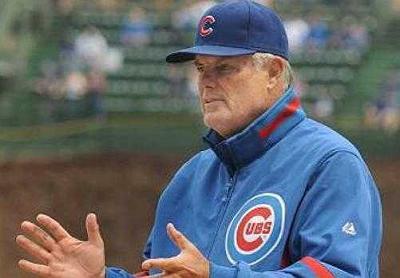 Lou Piniella will step down as manager of the Cubs after Sunday’s game against the Braves due to family reasons, the team announced. Piniella’s mother has been in poor health, and he has left the team twice to tend to her at their Tampa home. Mike Quade has been named interim manager for the rest of the season, beginning with Monday’s game at Washington. Hendry said Quade will be a candidate for the managerial opening in 2011, but that bench coach Alan Trammell would not. In a statement, Piniella said: “When I previously announced my intentions to retire at the end of the season, a primary reason for my decision was that it would allow me to spend more valuable time with my family. That time has unfortunately gotten here sooner than I could have ever expected. As many know, the several weeks since that announcement was made have been very difficult on a family level, requiring two leaves of absence from the club. While I fully intended to manage this club the rest of the season, a family situation at home now requires my full attention. Piniella and Braves manager Bobby Cox hugged at home plate as they exchanged lineup cards before Piniella’s final game. Cox is retiring after the season. Piniella then waved his cap to the Wrigley Field crowd and teared up. It was an emotional moment for the series finale. Piniella has been a part of baseball for 46 years, including 20 years as a player for the Orioles, Indians, Royals, and New York Yankees and then followed that up with a 24 year managerial career with the Yankees Reds (winning the 1990 World Series), Mariners, Devil Rays, and Cubs. He was the AL Manger of the Year twice, in 1995, and 2001, and the NL Manager of the Year in 2008. And, he remained well liked throughout those years. Even after he left the Yankees the fans would always cheer the familiar “Lou !” when he took the field as the opposing manager. Piniella was one of the good guys, and he’ll be missed. I’m betting we’ll be seeing him in Cooperstown someday soon.